EYE - BLUE DISCOLOURATION of the surface in an Angora goat. The ‘blueish’ discolouration of the surface of the eye (cornea) can be caused by a number of different factors in Angora goats. 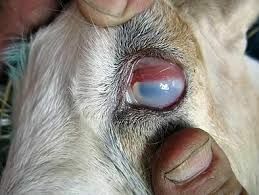 The most common cause of an individual goat’s eye discolouration is some form of irritation, scratch or laceration to the cornea (surface of the eye) by vegetation, grass seeds or dust. Usually just the one eye is affected. These injuries are painful and the eye may be kept shut. Swelling and cloudiness of the eye can be seen and is usually blueish in colour due to the inflammation of the cornea. The conjunctiva (tissue around the surface of the eye) may be swollen and red. When a number of goats are affected then Opthamnia ‘aansteeklikeblindheid’ ‘Pink eye’ is probably the infectious cause of most concern to mohair producers. The proper name is infectious keractoconjunctivitis which is the inflammation of the cornea and conjunctiva. Pink eye affects Angora goats and sheep. The bacteria implicated (Chlamydophila, Mycoplasma or Moroxella) cause the condition to be highly infectious and easily transmitted between infected goats. The cornea (surface of the eyeball) may at first appear grey and turn blue/white. The eyelids may stick together and excess tear production occurs. The conjunctiva is red and inflamed. An ulcer may develop on the cornea and the cornea may even rupture. In young kids Entropion may be the cause of the discolouration due to the irritation of the surface of the eye by the eyelashes. Inversion of the lower eyelid is either present at birth or appears soon afterwards in kids. The ocular discharge quickly becomes purulent. Direct contact between the eyelashes and cornea causes a severe keratitis with ulceration in more advanced cases with consequent blindness. The condition frequently affects both eyes. The condition may be inherited. On rare occasions Glaucoma may be the cause of the discolouration. Glaucoma is caused by an abnormal increase in pressure inside the eyeball and leads to a swollen, large, protruding eye which may have a blueish colour. Glaucoma in Angora goats are usually caused by diseases causing inflammation to the eye such as ‘pink eye’, corneal ulcers, trauma or cancer. The reason for the swollen globe is that the drainage of the fluid contained in the eye is impeded, fluid and pressure build in the eye which may lead to damage to the retina and optic nerve can result in permanent loss of vision. Some live vaccines (Bluetongue in sheep) have also been known to cause the blueish opacity in sheep. Treatment may depend on the underlying cause. Farmers have found that by also squirting some tetracycline (off licence) into the eye as well as the intramuscular injection at the doses above has been effective. Sometimes, sub-conjunctival injections of long-acting tetracyclines or penicillin are given but involves some skill. 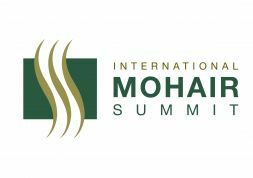 Other treatments that have been effective include intra-mammary preparations placed directly in the eye on a daily basis. Powders have been found to be irritant and in certain cases can worsen the clinical signs. Before applying medicine to the eye, the goat's face should be cleaned and the debris around the eye(s) should be removed. Gloves should be used when affected animals are handled as potentially humans may become infected. Using fly repellents around the face will also help control the spread of the disease. Affected animals should be isolated from the rest of the flock. They should be housed in a clean, dry and shady place. Despite intensive efforts, treatment may have little effect on the course or severity of the disease and hence the frustration in getting the condition under control on the farm. Severely affected animals may take longer to recover. Recovered animals have resistance for varying lengths of time. It is possible for them to become re-infected, as acquired immunity is not strong or long-lasting. In cases of trauma to the surface of the eye topical treatments can be sourced from your vet. Farmers have also used intra-mammary preparations and tetracycline injectables administered topically (off licence) on the surface of the eye. It is always best to seek advice from your vet before treating these cases. © SA Mohair Growers - 2019 | Links | EYE - BLUE DISCOLOURATION of the surface in an Angora goat.